ASUS introduced the GeForce GTX 680 DirectCU II TOP, a new custom-design card with a 1201MHz core. Also launched is the GeForce GTX 680 DirectCU II OC Edition, this model has the same cooling solution but has more conservative clockspeeds (1019MHZ core, 1084MHz boost). The ASUS GeForce GTX 680 DirectCU II TOP graphics card delivers a true flagship product for dedicated PC gamers and performance enthusiasts. The TOP-selected 28nm NVIDIA GeForce GTX 680 GPU has been overclocked by ASUS to 1201MHz to boost frame rates in games, offering users 143MHz over reference. Its ASUS-designed DirectCU II thermal design runs 20% cooler than stock, while the twin 100mm fans keep noise at bay with 14dB quieter operation. ASUS has added 10-phase DIGI+ VRM digitally regulated power delivery with 30% noise reduction, working in tandem with durable Super Alloy Power components that last 2.5 longer than reference. Users can tap the greater overclocking and overvolting capabilities of the card through both the hardware-level VGA Hotwire and the software-level GPU Tweak utility. Also released is the ASUS GeForce GTX 680 DirectCU II OC edition, with a 1019MHz core capable of a 1084MHz boost clock. This card uses the same DirectCU II cooler and PCB as the TOP version. ASUS TOP graphics cards utilize the best-performing GPUs available, chosen via a rigorous set of trials. The GeForce GTX 680 DirectCU II TOP arrives factory-overclocked to 1201MHz on the core, boosting frame rates for smoother and more fluid gaming in even the most demanding of situations. Due to passing extensive heat tolerance tests, TOP GPUs can handle extra overclocking strain, and are matched by ASUS engineers with an upgraded PCB that can also withstand more heat and stress than reference parts. Especially customized and fitted to match the power of factory-overclocked GeForce GTX 680 GPUs, the exclusive ASUS DirectCU II thermal design lowers temperatures to ensure faster, quieter, more stable, and longer lasting performance. Using five all-copper heatpipes and a 20% bigger dissipation area than reference, DirectCU II guarantees more expedient heat removal. It also features twin 100mm sound-dampened fans for increased airflow, resulting in 20% cooler and 14dB quieter operation on average compared to reference GeForce GTX 680s. This allows gamers to enjoy the utmost performance with minimized noise interference, a highly coveted and appealing proposition. The GeForce GTX 680 DirectCU II plays host to two exclusive ASUS power delivery technologies. DIGI+ VRM, based on a design used on bestselling ASUS motherboards since 2010, offers digital voltage regulators for a wider modulation range and therefore more flexible overclocking. The version of DIGI+ VRM used here applies 10-phase delivery and reduces power noise by as much as 30% compared to reference. Reduced power noise translates into more stable power supply and thus more consistent and reliable card performance. Combined with extra-durable and anti-corrosive Super Alloy Power components (solid state capacitors, chokes, and MOSFETs), DIGI+ VRM contributes to a card that runs 15% more efficient than reference models while maintaining 2.5 times the product lifespan. 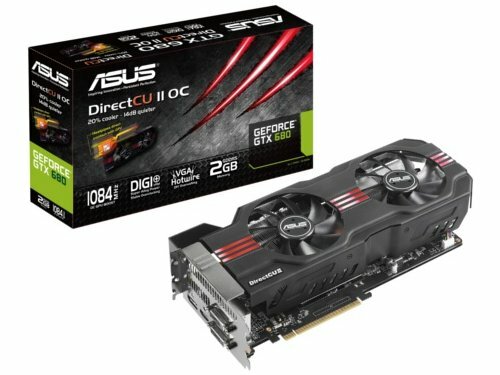 The GeForce GTX 680 DirectCU II TOP ships with extensive software overclocking by way of GPU Tweak, the exclusive ASUS card tuning suite. Using a highly intuitive interface, GPU Tweak helps users adjust clocks (including new boost clock settings), power consumption targets, voltages, and fan speeds, with multiple profiles available for different applications and needs. This is complemented by the addition of VGA Hotwire, a feature previously offered by ASUS ROG motherboards. For DIY-minded users, VGA Hotwire presents the benefit of more precise and complete hardware-level overvolting. Users can solder wires directly onto voltage regulators for more accurate Vcore, Vmem, and PLL readings and adjustments, opening up even more of the powerful card’s potential.